Note:The Size Chart Is Update!!!! To ensure the satifaction of your order, please carefully read the Size Chart we provided in the following description (Not Amazon Size Chart,)Please measure the actual size not according to your experience to choose Measurements: (0X)12W- bust42.51",waist39.37",length29.13" (1X)16W- bust44.09",waist40.94",length29.13" (2X)20W- bust45.66",waist42.51",length29.52" (3X)24W- bust47.24",waist44.09",length29.52" (4X)28W- bust48.81",waist45.66",length29.52" (5X)32W- bust50.39",waist47.24",length29.52"(6X)36W- bust51.96",waist48.81"，length29.52"This tops is design for the plus size ladies,more details please refer to our size chart on the bottom of the last display photo. Note -Please allow 0.4inch differ due to manual measurement -According to the light and different computer monitors,the color is Black and Red ,but actually slight pink&salmon red/coral The model information: Height：170cm Weight:98kg Bust:115cm Waist :90cm Hip:129cm. 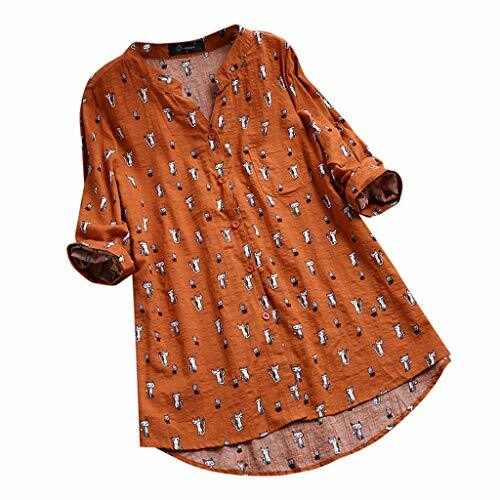 Wear:12W (a little tight in upper arms). 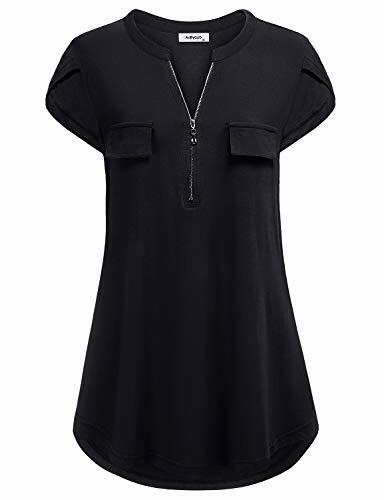 Ca Kra Women's Casual Summer Short Sleeve V-Neck Loose Tunic Blouse Tops Shirt Item Information: - Flattering loose fit keep you feeling relaxed. 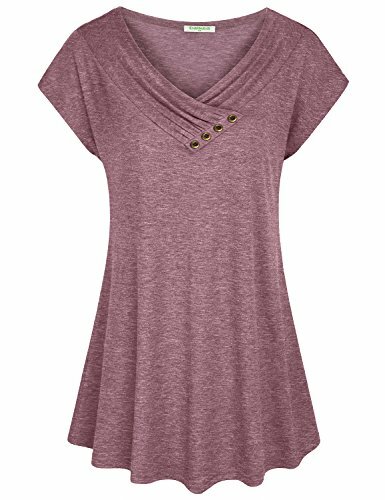 - Lightweight and soft fabric gives you all day comfort. - Pleated At Front can hides your belly prefectly. - Solid Color simple and generous. 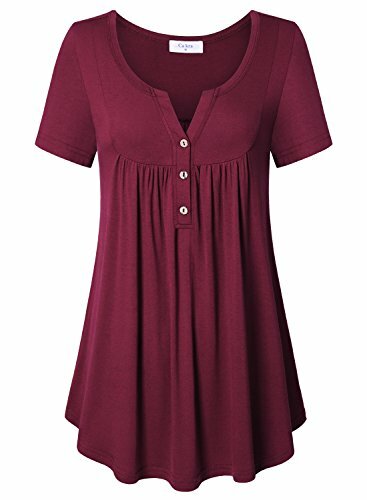 - Henley V Neck elongates your slender and graceful curvy. 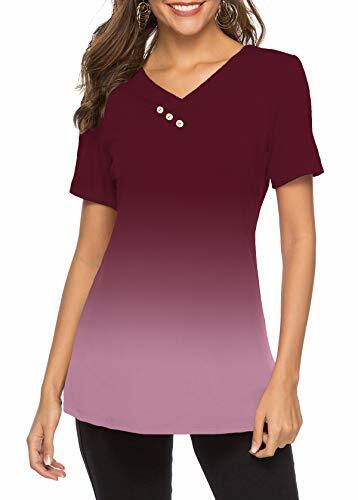 - Decorative Buttons match v-neck increasing classic fashion and leisure style. - Short Sleeve design makes you feel nice and cool in summer hot days. - Comfy Material: 95% rayon, 5% spandex. Notes: (1)Color Differences Allowed for Light Effects. (2)US size is one size LARGER than Asian size. (3)There maybe have 1-2 inch tolerance for the measurement and that is normal situation. If you are between sizes, we recommend sizing up. 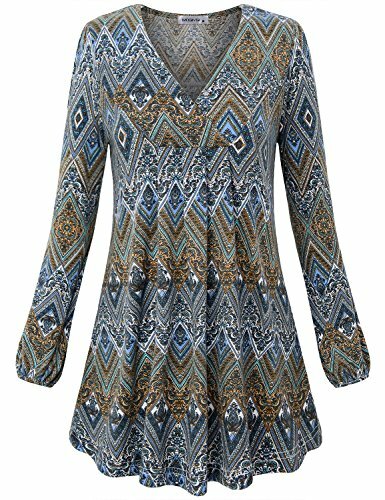 The dress is lightweight and breathable,making you feel cool and comfortable in the summer.The specially ethnic style design makes you look so special and attractive. 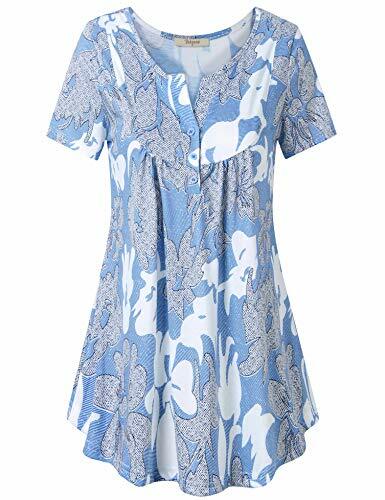 Size detail: Size S:Bust:38.6"~Shoulder:14.6"~Length:33.5"~Sleeve:16.5" Size M:Bust:40.2"~Shoulder:15"~Length:33.9"~Sleeve:16.9" Size L:Bust:41.7"~Shoulder:15.4"~Length:34.3"~Sleeve:17.3" Size XL:Bust:44.1"~Shoulder:15.7"~Length:34.6"~Sleeve:17.7" Size 2XL:Bust:46.5"~Shoulder:16.1"~Length:35"~Sleeve:18.1"
Features Material: Chiffon. Soft material makes you feel comfortable. 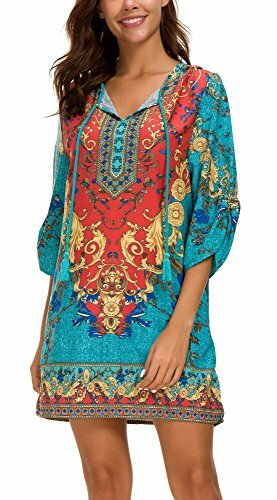 Design Points:Vacation, Cute, Boho, Peasant, A Line,Mexican ,Three quarter Bell Sleeve, Bohemia. 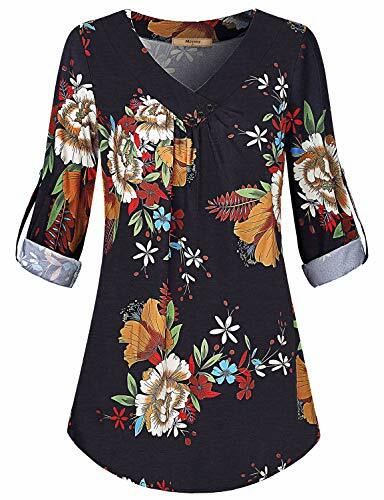 Suitable for Summer, Spring, Fall, Vacation, Casual Outtings, Office, School, Home, New Year and Daily wear. Size Chart: Small : Shoulder 38cm------Bust 98cm------Length 84cm------Sleeve 49cm; Medium : Shoulder 39.5cm----Bust 103cm-----Length 86cm------Sleeve 50cm; Large : Shoulder 41cm------Bust 108cm-----Length 88cm------Sleeve 51cm; XLarge : Shoulder 42.5cm----Bust 113cm-----Length 90cm------Sleeve 52cm; 2XLarge: Shoulder 44cm------Bust 118cm-----Length 92cm------Sleeve 53cm; 3XLarge: Shoulder 45.5cm----Bust 123cm-----Length 94cm------Sleeve 54cm; Comment If you are happy with our product please spare some time to give us feedback and review. If you have any problem with your purchase please kindly email us before left neutral or negative feedback.we will try our best to serve you. Notice 1).Please allow 1-3" differences due to manual measurement. 2).Due to light and screen difference, the item's color may be slightly different from tease understand. make sure you don't mind before you buy. 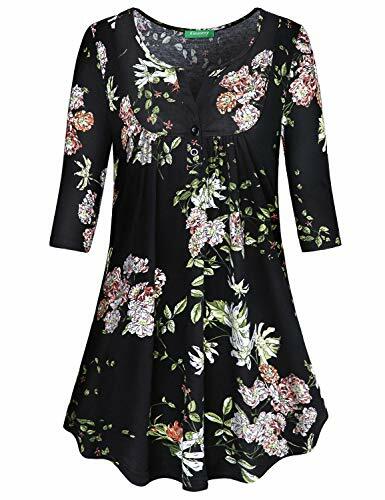 Material:Polyester.Sleeve:Long sleeveStyle:CardiganSize chart:S: Bust:90cm--------Shoulder:35cm--------Length:67cm--------Sleeve:58cmM: Bust:94cm--------Shoulder:36cm--------Length:68cm--------Sleeve:59cmL: Bust:98cm--------Shoulder:37cm--------Length:69cm--------Sleeve:60cmXL: Bust:102cm--------Shoulder:38cm--------Length:70cm--------Sleeve:61cm2XL: Bust:106cm--------Shoulder:39cm--------Length:71cm--------Sleeve:62cm3XL: Bust:110cm--------Shoulder:40cm--------Length:72cm--------Sleeve:63cm4XL: Bust:114cm--------Shoulder:41cm--------Length:73cm--------Sleeve:64cm5XL: Bust:118cm--------Shoulder:42cm--------Length:74cm--------Sleeve:65cmNote:-Please allow 1-2cm measuring deviation due to manual measurement.-Please check the Size Chart before order. If you are not sure the size, please send message to us. 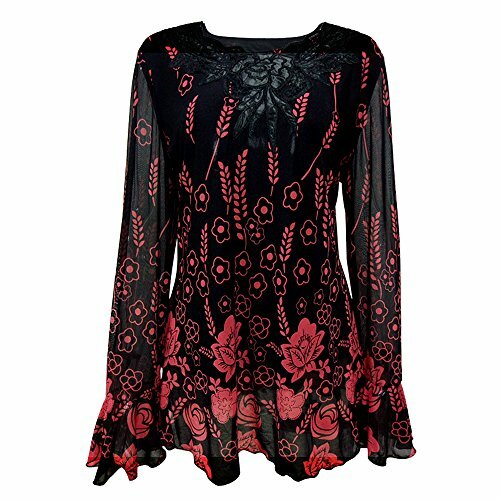 Fabric name: polyester fiberMain fabric composition: polyester fiberMain fabric component content: 30%-50%Style: Europe and AmericaPattern: plainsleeve length: long sleeveS:-----Bust--90cm-----Length--69cmM:-----Bust--96cm-----Length--70cmL:-----Bust--102cm-----Length--71cmXL:-----Bust--108cm-----Length--72cm2XL:-----Bust--114cm-----Length--73cm3XL:-----Bust--120cm-----Length--74cmSize doesn't fit all, please carefully check size chart and select the size based on your real size. Basic V-Neck Long Sleeve Tunic TopDoublju Women's Basic V-Neck Long Sleeve Tunic Top is high quality!SUPERIOR QUALITY FABRIC and Soft, comfortable and stylish specializing in the design.This Basic V-Neck Long Sleeve Tunic Top that look trendy and Plus SizeVERSATILE Basic V-Neck Long Sleeve Tunic TopBasic V-Neck Long Sleeve Tunic Top with Plus Size great stretch for comfort.Simply design Basic V-Neck Long Sleeve Tunic Top which is basic and stylish.This Basic V-Neck Long Sleeve Tunic Top is all season long suitable slip-on soft Rayon Basic V-Neck Long Sleeve Tunic Top. 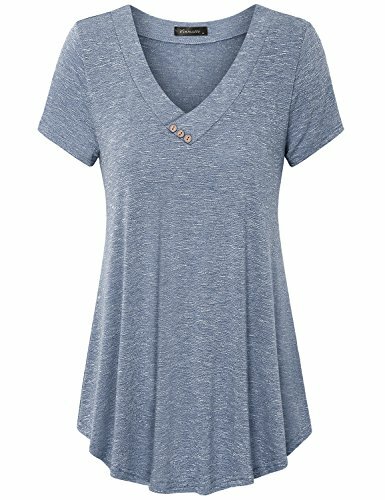 Looking for more V-neck Vintage Tunic similar ideas? Try to explore these searches: Lonsdale Training, Brown Harness Boots, and Bakeware Jelly Roll Pan. 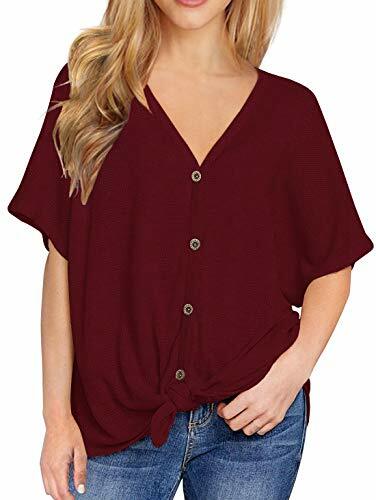 BlesDeal.com is the smartest way for online shopping: compare prices of leading online stores for best V-neck Vintage Tunic gift ideas, V-neck Vintage Tunic deals, and popular accessories. Don't miss TOP deals updated daily.